BilliardRadarTM is the very first augmented reality mobile app that assists you playing billiard on a real billiard table! 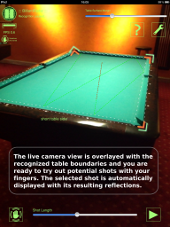 Stand or move around in front of a billiard table and point the camera of your device towards the table. 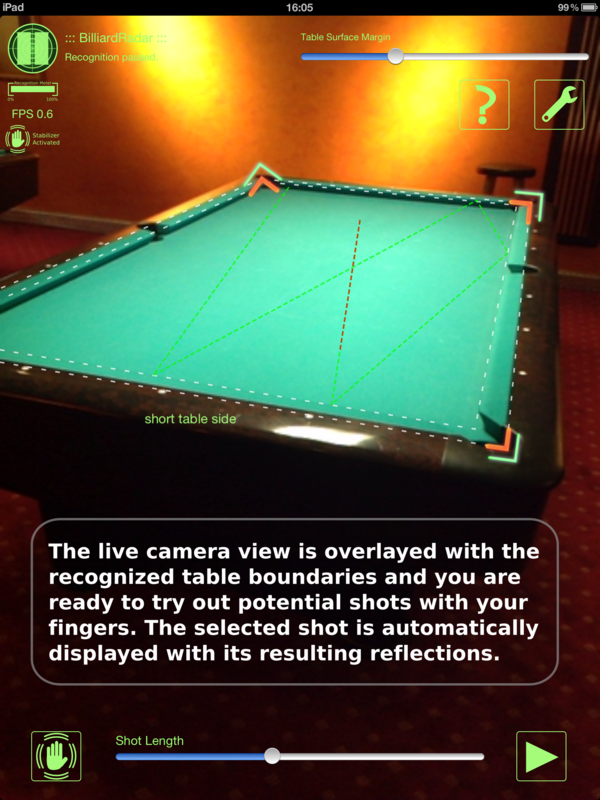 BilliardRadar displays artificial helper lines directly on the live video pictures in real-time, which help you with the next shot. Note: BilliardRadar has been discontinued. Live camera picture is shown, processed and overlayed with artificial helper lines in real-time. Boundaries of recognized table are marked with artificial lines on the screen. Either touch the screen 2 times with one finger or with 2 fingers at the same time to span a potential shot, the resulting shot will be calculated and displayed immediately. 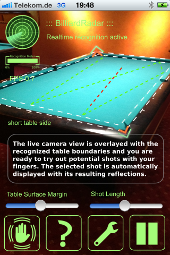 Move the "Shot Length" slider to adjust the length of the calculated resulting shot. Walk along the table, the calculated shot will be updated on the screen according to the respective new camera perspective. 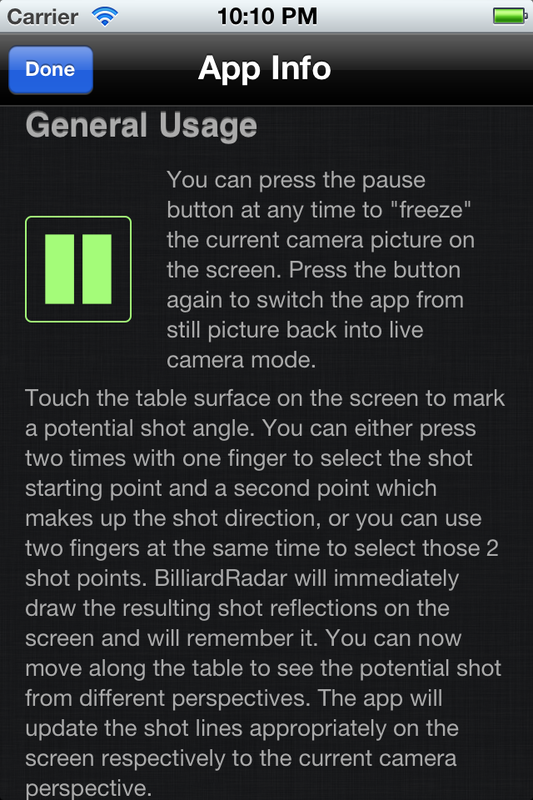 Hit the "pause" button to "freeze" the current camera picture on the screen to be able to place and evaluate potential shots more conveniently, hit it again to switch back to live camera mode. Integrated stabilizer function which filters noisy camera images (can be switched off at any time to increase speed). 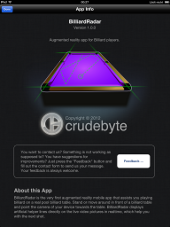 This app supports HD, that is it supports the full resolution of the iPad 3 and iPhone 4 / 4S retina displays. 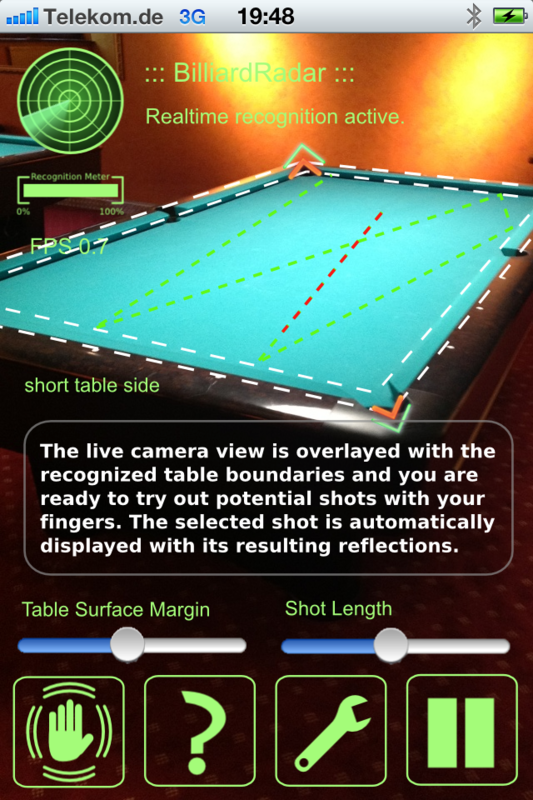 � Please note: this app assumes the billiard table to be standard rectangular shaped, that is very exotic billiard tables like e.g. 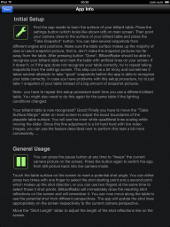 circle tables are not supported at this time. 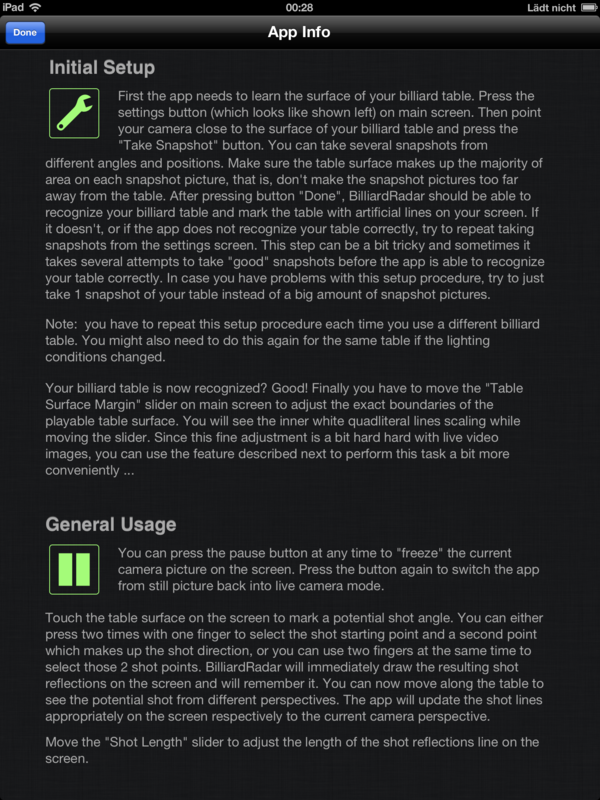 Important: this app requires an integrated camera! 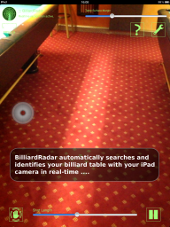 BilliardRadarTM is currently available for the following mobile phones and tablet devices. In case you encounter any problems while using this app, please report it to us by using the feedback link at the end of this page. 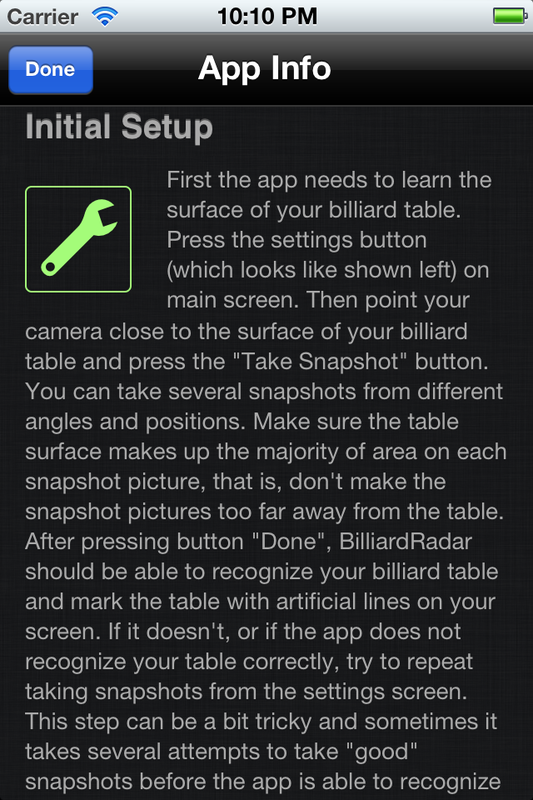 You can get BilliardRadar through iTunes from the Apple App Store. 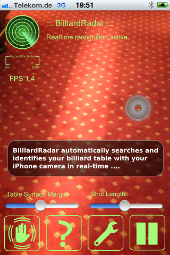 BilliardRadar supports full graphics resolution of the iPad 3 & iPhone 4 / 4S Retina displays. Note that you need at least iOS 5.0 or later and an integrated camera to be able to use this app. 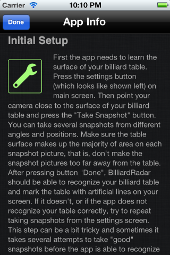 For mobile phones and tablet devices (like the Samsung Galaxy S and the Samsung Galaxy Tab) which run the Android operating system, you can get BilliardRadar from the Google Play Store / Android Market. 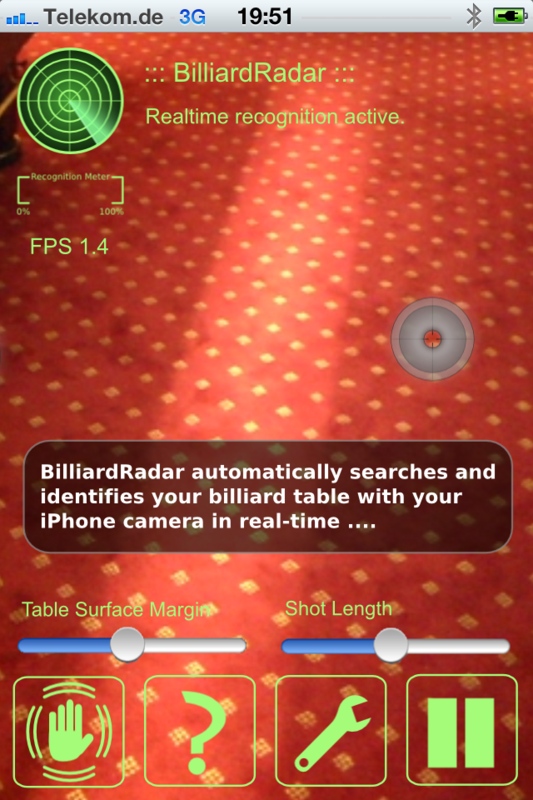 Note that BilliardRadar requires an integrated camera, Android OS 2.2 or younger and is only available for Android devices with touch screen so far. Your device is not supported yet? Don't hesitate to write us by using the feedback link below.